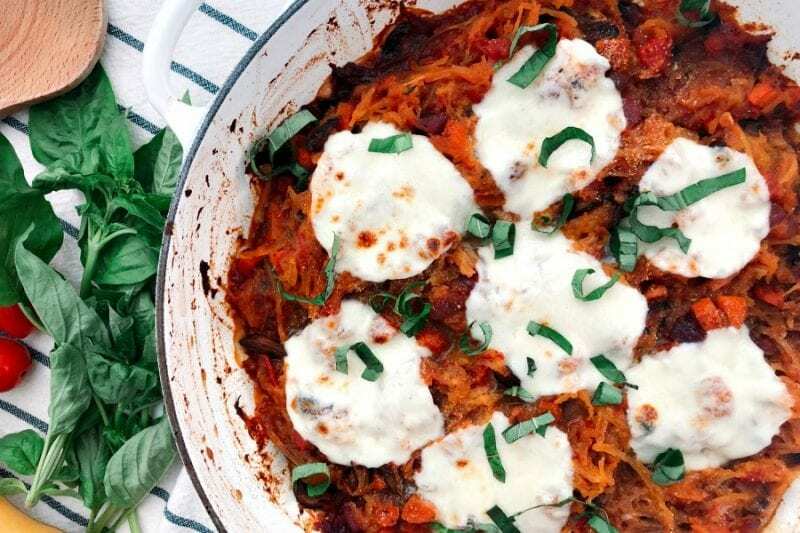 Vegetarian, paleo optional, Instant Pot Spaghetti Squash Bake. Stay with me! I promise you are going to fall in love. First, real talk? I do not typically make vegetarian dishes. Jeremy and I eat a lot of grass fed, organic beef and chicken around here. But this dish, it made me a believer. TBH, this meal was inspired by a visit from my sister! She is a vegetarian and I wanted to cook her something packed with flavor. It’s super easy and budget friendly. It is also extremely quick to cook. Because, the Instant Pot (IP)! If you are one of the masses that got an Instant Pot for Christmas but don’t know where to start – this recipe is going to make you a believer. If you didn’t get a magical Instant Pot – you can still make the squash in the oven (full recipe at the end of the post). For the IP, cut your spaghetti squash widthwise so it will fit. Scoop out all the seeds with a spoon (or your hands). Add 1 cup of water and the steamer basket to the IP. Fit your squash inside. Seal the IP and push the valve to “sealing.” Click the manual button and hit the “+” sign until you reach 7 minutes. That is it! That is it! That is it! While it is coming to pressure and cooking, we can prepare the additional ingredients. I make this vegetable-rich by adding lots of mushrooms, carrots and red onion. But you can add what you have on hand. I like to brown the mushrooms first to get them nice and caramelized. Then everything else goes in for a quick sauté! Once the squash is done, use a fork to pull the strands apart. This is my favorite part! This dish really gets a lot of flavor from a jar of pasta sauce. I use Rao’s brand because it is paleo and they have some great options. We like a little kick so I typically use the arrabbiata kind but their roasted garlic one is delicious too! Mix it all together. It you are keeping this paleo you can top with fresh parsley or basil and serve! If you are able to add cheese, I recommend sprinkling the top with shredded parmesan cheese or slices of mozzarella and then putting it into the oven under a broiler until the cheese gets melty and bubbly! This dish is so quick and easy and it pleases your veggie loving friends – but your meat loving friends will be incredibly satisfied too. In fact, it is so good that in the morning we warm the leftovers and add an over easy egg on top to have it for breakfast. It’s kind of a twist on eggs in purgatory and it is everything savory breakfasts are made of! Scoop out the seeds with a spoon or your hands. Add the steamer basket to the IP and then 1 cup of water. Fit the spaghetti squash inside the IP. Lock the lid and set the valve to “Seal.” Click the “Manual” button and hit the “+” sign until it is at 7 minutes. While the squash is cooking, add 1 TBS oil to an oven safe sauté pan over medium high heat. Add the sliced mushrooms. Brown on each side for 3-5 minutes (to caramelize the mushrooms for depth of flavor). Add the carrots and onion. Saute for an additional 5 minutes. Once the squash is done, let the pressure come down manually (I usually wait about 10 minutes). Then, push the valve to venting and open the IP. With a fork scrap the flesh of the squash into spaghetti strands. Discard the skin of the squash. Add the squash to the saute pan with the vegetables. Add the marinara sauce, salt, pepper and red pepper flakes. Mix until combined and let cook for 3-5 minutes. Taste and add additional salt if needed. Optional: turn on broiler in oven. Sprinkle shredded parmesan cheese/mozzarella all over spaghetti squash mixture. Place skillet under broiler until cheese is melty and bubbly, about 3-5 minutes. Cut squash in half lengthwise, scoop out seeds. Cover a baking sheet in tin foil and coat in oil. Place spaghetti squash, cut side down, on baking sheet. Use fork to turn the flesh of the squash into spaghetti!